Wing Update! Two NEW Flavors at Dew Drop Inn Make My Favorites List! When Dew Drop Inn reopened a few weeks ago after a month’s hiatus for renovations, they opened their doors with 60 new wing flavors on their menu (you can read more here). Seriously, sixty new flavors. I’m determined to try as many of the 60 new flavors as possible and I’ll be posting regular wing updates. A wings craving today meant a visit to Dew Drop Inn for lunch and the first wing update! 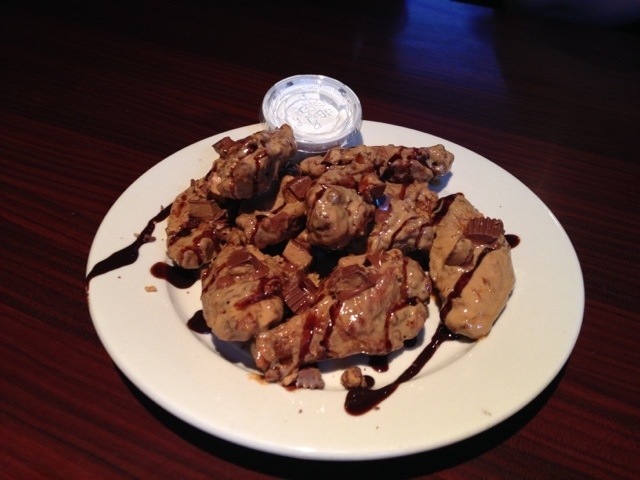 When we asked about the Maple Butter Wings today we learned that they are one of Dew Drop’s most popular flavors. Now, I don’t always like to follow the crowd, but with some things, like food, best-sellers are popular for a reason and I’ll give them a try. And when the Dew Drop staff makes a recommendation I always listen because they never steer me wrong. 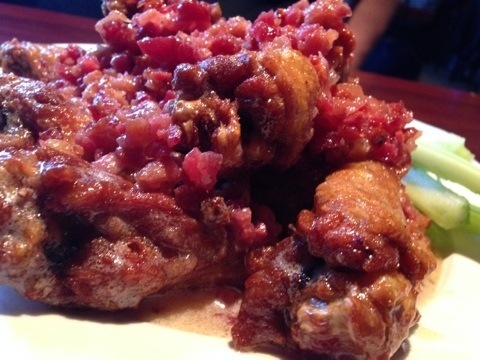 Any rumors you’ve heard floating around about how good the Maple Butter Bacon wings are – they’re true! The maple taste is light, adding a subtle flavor and level of sweetness, which compliments not only the butter it’s mixed with to coat the wings, but also the bacon crumbled over the top of the wings. 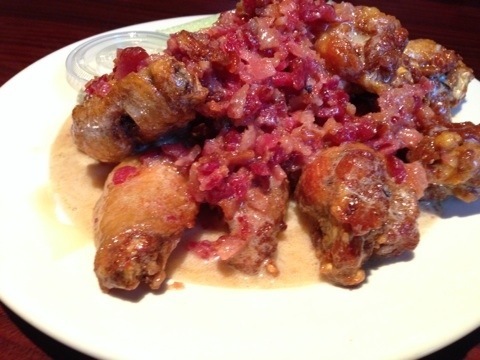 If you’ve tried the Honey Butter wings before, the Maple Butter Bacon wings are similar: the wings are fully coated yet it’s still light enough that you still taste the chicken wing itself. What makes this flavor unique is the subtle taste of maple and the crumbled bacon on top, which is also coated in the maple butter. 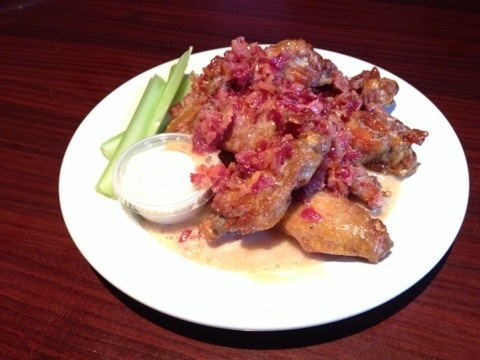 Bacon makes everyone happy, and bacon crumbled over the top of wings coated in maple butter is perfection. Yes I did, I ordered the Reese’s Cup wings! Dew Drop posted a photo of their Reese’s Cup wings last week on FaceBook and it completely got my attention: Reese’s Peanut Butter Cup + peanut butter + chocolate + Dew Drop’s wings = hell yes! I was so excited to try these wings I had trouble sitting still in my seat; every time an order came out of the kitchen I’d watch it, hoping it was mine. The Reese’s Cup wings are tossed in peanut butter, plated, and topped with drizzled chocolate and chopped Reese’s peanut butter cups. Now, if you’re thinking that these ingredients make the topping for an ice cream sundae and not chicken wings I must politely disagree. 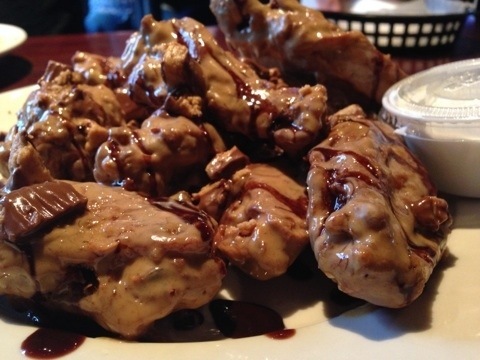 If you’ve had the PB&J wings at Dew Drop you’ll like the Reese’s Cup too (read more here). If you’ve had neither, what are you waiting for? 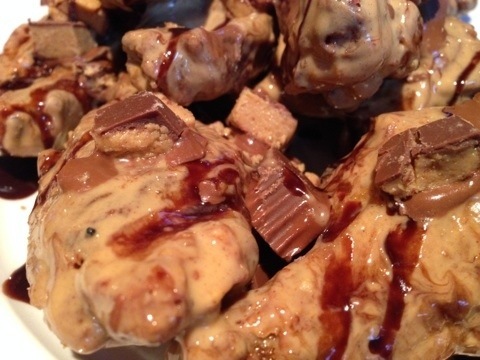 The Reese’s Cup wings are gooey and peanut buttery with just enough chocolate drizzled over the top so that the chocolate doesn’t overwhelm the other flavors. The chopped Reese’s cups elevates these wings to a level of flavor and uniqueness that is synonymous with Dew Drop, in my opinion. One of Dew Drop’s owners taught me the trick of the best way to eat the Reese’s Cup wings for maximum flavor today. Jay said you need to bite into the wing where the chopped Reese’s cup is, this way your mouthful of wing has the chicken wing, some gooey peanut butter and chocolate, and the Reese’s cup that will melt in your mouth. Jay is absolutely right – that’s how you eat the Reese’s Cup wings! Oh my goodness! Reece’s cups on wings!?! I have to admit, after reading your post I am slightly intrigued! I have to check this place out!